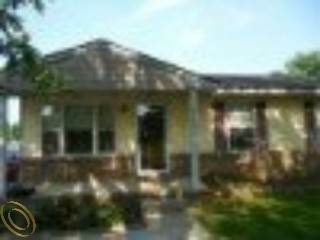 Bathrooms: 2 "1ST F BTH"
Garage: "2 CAR DET,SIDE ENTRY"
Size: 1,098 sq. ft. "CITY"
Fabulous ranch with wooden deck on the back~Big eat-in kitchen w/Oak cabinets!Two doorwalls lead into a nice fenced yard~full basement~Good cond and well maintained~Tenant occupied~24 hour notice for showings*Close by October 31,2011 and request 3.5% of the final sales price to be used as closing costs assistance! Plus, selling agent may receive a bonus. Eligibility restrictions.